Snippets of Jack: "Well That’s Just Maddeningly Unhelpful." "Well That’s Just Maddeningly Unhelpful." 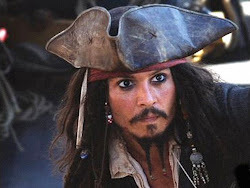 After being eaten by the Kraken (stupid Elizabeth's fault) Jack was essentially marooned in a never ending desert on board his ship The Black Pearl. Jack was happy to be captain again, until his crew (a bunch of hallucinations) unable to produce wind to move the ship go, got on his nerves, as usual. He grabbed a rope and started pulling his ship across the endless field of sand. "Gentlemen...I wash my hands of this weirdness." Tia Dalma, who was on board the ship that was sailing to find Jack; used her magical powers to help her beloved Jack. A large amount of crabs appeared and crawled out of the ship and started helping Jack to move The Pearl. While Jack is hard at work pulling the ship his rescue crew was trying to figure out how to get to Davy Jone's locker, they end up ship wrecked on the beach right in front of Jack. However, Jack wasn't very pleased with them at the moment. Well who would be? 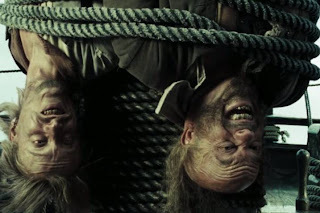 Elizabeth killed him, Barbossa as marooned him on an island twice, Will is just odd, and Barbossa's crew were a part of the mutiny that resulted in the first marooning. 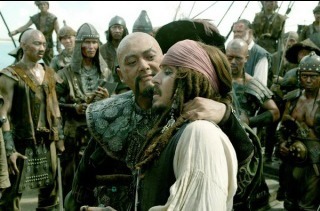 But alas; Jack can't sail without a crew and He and Tia Dalma are still friends, so eventually they came to an agreement. Now all they had to do was get out of the Locker. Not an easy task mind you. Jack clearly being the smartest one comes up with answer "Up is down. Well that’s just maddeningly unhelpful. Why are these things never clear? " After examining the map with all the unknown answers, He figured it out. Jack started running from one side of the side to the other, and eventually the crew realized what was happening and were quite helpful. Others were upside down, tied to the mast. (Pintel and Ragetti. aka the silly pirates) After several laps across the deck the ship was flipped and everyone returned to the land of the living, YAY! However the happy moment ended quite fast. Everyone important whipped out their guns and they had a nice discussion about what to do next. Hector insisted that Jack had to come to the gathering of Pirate Lords, Jack pretty much refuses. Jack "shoots" Barbossa only to realize that during their escape from the Locker all their guns became useless due to wet powder. So now that they can't fight they all start to be useful once again, Will locates a fresh water spring, (to bad it couldn't be a rum spring) and they set sail in the general direction of Shipwreck City, and the gathering of The Brethren Court. However, they don't get very far. Sao Feng and his crew on board the ship Empress were lying in wait, just around a bend in the island. Feng brought Elizabeth on board his ship and preceded to dress her up, ( remind you of anyone?) and try to convince her that she is a goddess. What a creep. Apparently Cutler wasn't very pleased with Feng, seeing as he sent a ship after him that opened fire on the Empress. During this onslaught Feng was struck in the chest with a giant chunk of debris. With his last breath he named Elizabeth the Captain of his ship, and gave her his Piece of Eight. And the Empress set sail for Shipwreck city, under the Guidance of their new captain Elizabeth Swann; newest Pirate Lord of the Brethren Court.